Anti-Gaddafi rebels were reportedly moving towards the leader’s hometown of Sirte last night for a showdown with his heavily armed tribe. The battle, which is said to be cardinal both symbolically and strategically, could be the bloodiest seen since the conflict started, Libyan sources have told The Times. 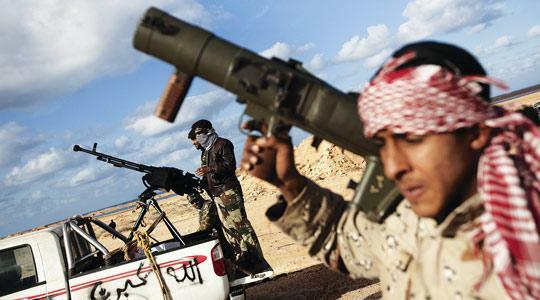 The rebels were just 60 kilometres east of Sirte on Saturday night in the city of Harwah and were moving westwards after last week they conquered the eastern oil refinery towns of Brega and Ras Lanuf, according to two distinct Libyan sources, Mohammed Abdalla and Adel Alghrini. Both support the struggle and are based outside Libya (Malta and the UK respectively), however they are in contact with a network of rebels on the ground feeding them with information. The battle in the central Libyan town – which was expected to kick off sometime between last night and today – should not be taken at face value, Mr Abdalla warned. Because of its geographical location, Sirte is the meeting place for many tribes, besides being the hometown of Muammar Gaddafi’s tribe. He said many intertribal issues bubble below the surface of Sirte between about other seven tribes and Gaddafi’s tribe, which gained the upper hand when the dictator took over the country’s reins more than 40 years ago. His tribe, however, is heavily armed. “They have been going round the city with speakers and threatening people that if they go against Gaddafi they will demolish their house,” he said. However, all the other tribes were waiting for an outside “spark” to take on the leader’s tribe, even though it was going to be a very hard battle because of the heavy weaponry in the possession of Gaddafi’s people, he said. This means a bloodbath is expected, with a much larger number of casualties than in Tripoli, he pointed out. Meanwhile in the Libyan capital, Libyans woke up to the sound of intense gunfire yesterday, which government officials said was to celebrate the recapture of a number of cities from rebel forces — something which has been denied by anti-Gaddafi forces. The advance on Sirte comes as the news wires were agog with conflicting reports of the situation on the ground. Claims by the Libyan state TV that the government had re-captured Zawiyah, Tobruk, Raslanuf and even Misurata, were rejected by witnesses on the ground. “Tobruk is a free city now Alhamdulillah (thank God). In Zawiyah they are still fighting and revolution brothers are still in control. Yesterday, he (Gaddafi) brought 12 tanks inside but four of them have been taken over by the revolution,” Mr Alghrini said. Mr Alghrini said family and friends have told him the situation on the ground is not at all like the state television is reporting. Misurata remained a “free city” he said, and people were forming a family-like community, helping each other with free food and medicines. However, Mr Abballa said the port town was reported to be plagued by some 20 tanks firing randomly at houses. In Zawiyah the situation is critical and a similar attack is compounded by the fact that the people there, having little access to outside cities, are starving and seriously short of medicines due to lack of supplies. According to Malta-residing Libyan Khaled Baara, some 33 people died in clashes in the city on Saturday night. Ras Lanuf, a key oil refining town, also remained in the hands of the rebels after they successfully seized it on Friday, Mr Alghrini said, pointing out that they expected air force fighter planes to bomb them soon and hoped for help from the UN to enforce a no-fly zone. “Like that he can’t do much with his militia because at least 90 per cent of Libyan soldiers are with us now. He is relying on the militia, which he brought from places like Mali, Nigeria and Uganda,” he said. “These militia fight for money, if they see people stand up to them, they will surrender like they did in Benghazi,” he continued, pointing out that their motivating force was not as strong as that of the protesters. Reports from international media and their correspondents supported claims that the four cities Gaddafi forces claimed to have taken over are still in the hands of the rebels. However, The Times sources rejected another story carried by the AFP news agency which said that Bin Jawad, a city some 100 kilometres east of Sirte, had been taken over by Gaddafi. “I can confirm that it is still in the hands of the Libyan people but it is under attack,” Mr Baara said. Mr Alghrini reported the same thing, saying the town had been fighting back pro-Gaddafi forces for hours but they had not surrendered. “He only has Tripoli and Sirte left,” he said.